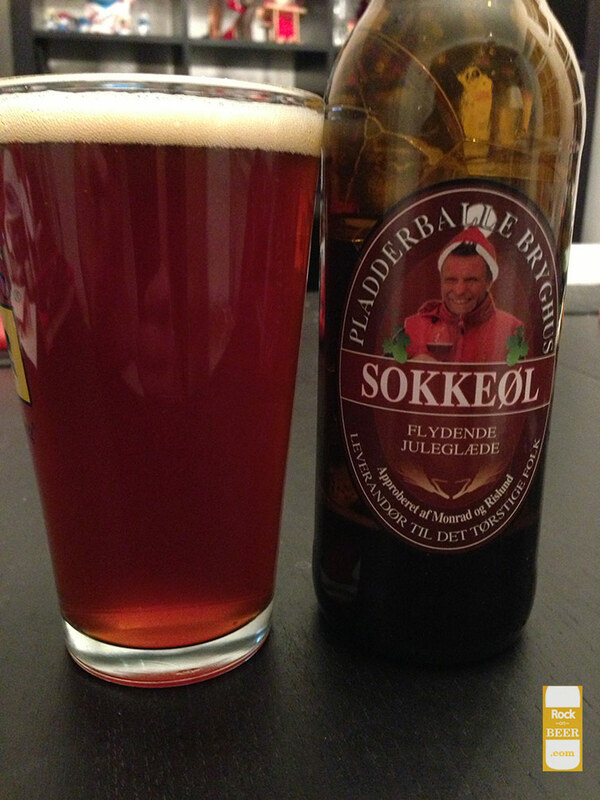 So here is Pladderballe's sokkeøl, or in english "sock beer". This is a beer made to honor the tradition of putting socks or stockings out for santa to put small gifts in. The bottle says that if you have been a good person this year then santa might put a bottle of this in your stocking. We will see if it is worth it or you should just hope for the coal. Pours a dark orange or maybe it is a light amber. Very very minimal head that is gone in the blink of an eye. The smell is heavy on licorice, the bottle lists star anise as an ingredient. You can certainly tell it is there. The taste is very much the same, just dominated by licorice flavor from the anise. You get a little bit of caramel sweetness from the malts, a little bit of dried fruit, and a very very mild bitterness in the end. The mouthfeel is what you would expect from a pilsner, with a little added acidity. I am not a fan of pilsners, or licorice, so these were two automatic strikes. Even without these personal preferences I would say this is a below average beer. It's a pity because I have really enjoyed their other beers. Oh well it is only a seasonal.